Salmonella poisoning has been around forever, but you may not have heard much about it before the recent food recalls and you may be confused about what Salmonella does and how you can protect yourself from Salmonella poisoning. Salmonella is a type of bacteria that is found in many places. Egg yolks may contain Salmonella (which is why it is inadvisable to eat raw eggs), you’ll find it on reptiles and amphibians (wash your hands with soap and water after handling pet turtles and snakes), and the bacteria can live and multiply on foods. 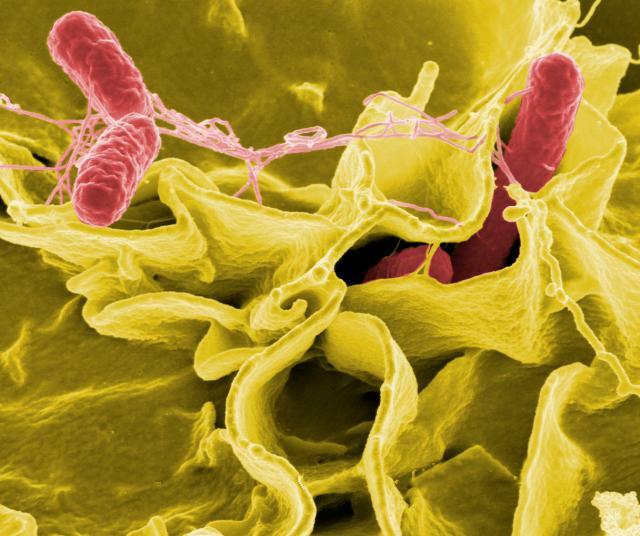 Unlike many other types of bacteria which produce poisonous compounds, Salmonella itself is toxic, plus it can colonize the body and cause various diseases. A lipopolysaccharide found on the cell walls of Salmonella triggers an allergic reaction, but the reaction to being infected by the bacteria is what causes most illness. Bacteria that are not killed by heat or the acidic environment of the stomach can colonize the small intestine and spread out into other parts of the body. The diarrhea, fever, cramping, and vomiting are associated with the body’s attempt to purge itself of the infection. Dangerous dehydration may result from being unable to replenish the fluids that are lost. You are at risk from Salmonella poisoning by eating foods which have been cooked or undercooked, by drinking liquids containing living Salmonella, or through direct contact with surfaces that harbor the living bacteria. This could include animals that carry the bacteria, contaminated cutting boards, or contaminated dishes. Cooking food, boiling water, and washing your hands and dishes with hot soapy water will protect you from Salmonella. There are several different strains or mutations of Salmonella, so the illness that you contract from the bacteria depends on which strain of Salmonella it was. The strain that causes typhoid fever is distinct from the strain that causes food poisoning or Salmonellosis. Health students made this video explaining how Salmonella works. While Salmonellosis is no laughing matter, the video is an entertaining way to educate yourself about this infectious agent. You May Also Like: What Exactly Is a Heavy Metal? ← Do Bubbles Pop from the Top or the Bottom?